One of the questions students always ask me is: How do you create a tweet that goes viral? Now if I could answer that question, I would be rich indeed. It’s plainly non-trivial, otherwise everyone would be creating memes and making money off of the ad revenue. The problem is that creating a meme, like writing a best-selling novel or like shooting a successful box-office movie, is what I call a dialectical problem—a problem whose solution changes whenever someone solves it. So if someone creates a meme, you can’t just copy it and expect it to go viral. You may get lucky and pass it off as your own to an unsuspecting group, but generally once someone creates a meme, you have to come up with a new one. Spread it to communities of participation. The problem is that (1) just begs the question: What is unexpected content? Value. An example is the answers to a difficult test. Verification (of a widely held but unproven belief). Validation (by an authority of a widely held but unproven belief). 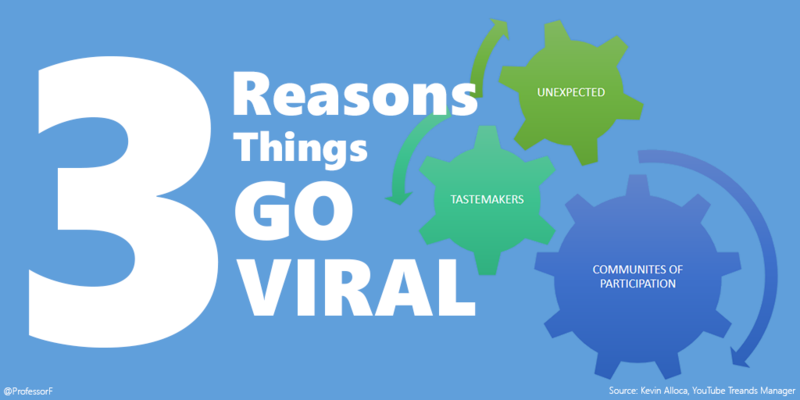 So, if your tweet, your video, or whatever social media content you create, contains at least one of these 4 elements it at least has a chance to go viral. There are no guarantees. Tastemakers and communities of participation are important, but your content first needs one of these four elements. In my next article, we’ll look at examples of memes containing Value, Violation, Verification, and Validation. Cognitive Gamification, Part 2: Why Games?